The much anticipated dispersal sale of the noted Millington Limousin herd was held at Borderway Mart, Carlisle on Friday 19th August 2016. The dispersal sale lived up to expectations with a 50,000gns top price and six animals in all making 9,000gns or more in a strong sale throughout. The leading price of 50,000gns and a new cow and calf breed record was paid for the four year-old-cow Millington Highlight who was sold with her heifer calf at foot, Millington Limelight. The full package, Millington Highlight combined visual appearance along with a depth of breeding and excellent performance figures. For good measure she also arrived with a lengthy show record that included two Reserve Supreme Championships at the Great Yorkshire Show. An embryo calf she is a Wilodge Vantastic daughter out of Brockhurst Option whose mother is the highly regarded Ronick McAinsi. The herd’s matriarch cow Brockhurst Option, lived until the age of 16 and certainly left her mark on the breed. She featured heavily throughout the day’s top prices with direct descendants grossing in excess of 100,000gns on sale day. Prior to this, she had already bred offspring to (28,000gns) Millington Davina, (10,000gns) Millington Ferrari, (10,000gns) Millington Choice. (9,800gns) Millington Vascular, (7,000gns) Millington Hampton, (6,000gns) Millington Dallas. (6,000gns) Millington Decision, along with other private sales. In all six animals made 9,000gns or more at the sale; proving the strength and depth of cattle in the catalogue that was described as ‘a rare opportunity to acquire some of the best Limousin genetics in the UK’. The sale of the Millington herd, owned for the past two years by Ashcourt Farms Ltd, followed a company restructure and change in farming policy. The Millington herd was originally established by John Weatherill some sixteen years ago and Mr Weatherill, who is looking to re-establish a Limousin herd, featured among the purchases during the day. Leading Mr Weatherill’s purchases was the 12,000gns that he paid for the served heifer Millington Joyous. Joyous is a Greenwell Fieldmaster daughter and out of the Highlander sired Millington Gracious. Another to go to the same buyer was the 10,000gns Millington Hilton who was sold with her first calf at foot, the bull calf Millington Mayfair by Norman Hawk. December 2012 born, Hilton is an embryo calf by Objat and is another out of the same dam as the top price, Brockhurst Option. At 11,800gns was another embryo heifer calf Millington Lapwing who was the same breeding, sired by Objat and out of Brockhurst Option. 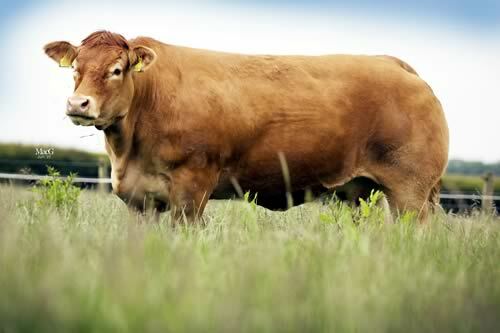 She was purchased jointly by the Calogale herd of Messrs Lee, Kidwelly, Carmarthenshire, along with the Frogmore herd of Chris White, Moreton-in-Marsh, Gloucestershire. Early in the sale Millington Gorgeous made 9,200gns. This 2011 born embryo calf is a Mas Du Clo daughter out of Brockhurst Option and was sold with her bull calf Millington Majestic at foot, a Norman Hawk son. This outfit was purchased by Bruce Goldie, Townfoot, Mouswald, Dumfries for his Goldies pedigree herd.